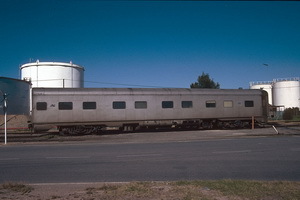 Second class, air conditioned, twin berth staggered corridor steel sleeping car built by Commonwealth Engineering. 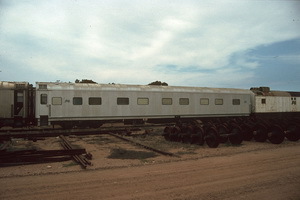 Second class, air conditioned, twin berth staggered corridor steel sleeping car built by Commonwealth Engineering. When it first entered service it was designated as "may have been used as a first class car" with only a single occupant in each compartment. 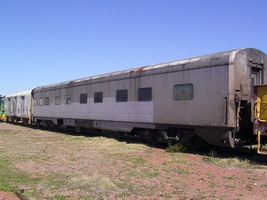 6.1990 Converted to crew car part of interior removed to build kitchen and lounge facilities, recoded "ECA 132". 22.12.2011 Cut up at Dry Creek and scrapped. It had not been used for at least 5 years prior to scrapping. 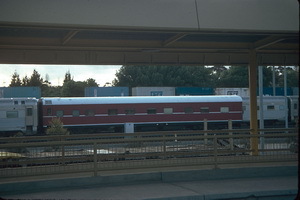 By 1995 Converted to "ECA 133" crew car. By 2011 In long time storage in the Dry Creek Yard. 23.3.1970 Converted to narrow gauge "NBRE 134" on 6 wheel bogies. 28.6.1982 Returned to standard gauge, allocated to CCE Alice Springs. 20.3.1964 Converted to narrow gauge "NBRE 135" and mounted on 6 wheel bogies. 2.10.1981 Returned to standard gauge. 31.5.87 At Keswick, still painted maroon. 2.1991 Converted to "ECA 135" crew car. 22.12.2011 Cut up at Dry Creek and scrapped. It had not been used since approximately 2000. 4.1995 On register as surplus vehicle. 6.1965 Equipped for alternate use as a first class car. 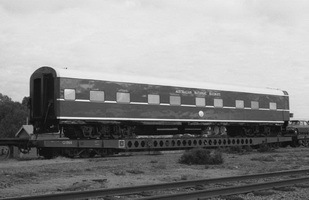 6.1965 Equiped for alternate use as a first class car. 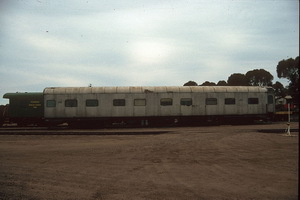 29.2.1988 At Pt Augusta in service. 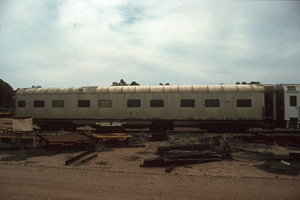 29.2.1988 Stored at Port Pirie. 1991 Converted to "ECA 162" crew car.